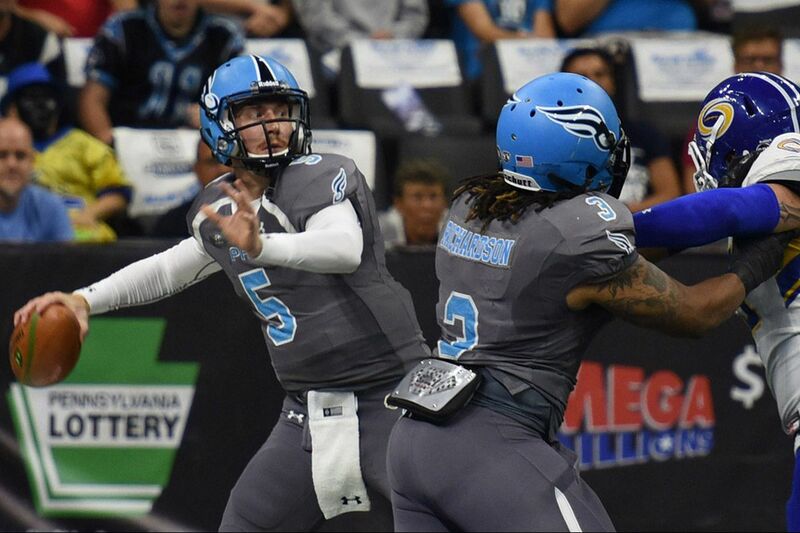 Philadelphia Soul Quarterback Dan Raudabaugh (left) threw five touchdowns in last Saturdays win. The Soul will take on the Baltimore Brigade in the first round of the playoffs on August 12 at 4 p.m at the Wells Fargo Center. The Valor beat the Brigade, 41-35, on Friday. The Soul's lone loss of the season came against the Brigade on July 8, a 49-42 loss. But, the Soul avenged the loss on July 29 with a 70-21 rout at Royal Farms Arena. The Soul lead the season series, 3-1. "This was our best performance all season," Soul coach Clint Dolezel said of the team's performance. "Both sides of the ball played lights out and we did what needed to be done to get the win." The Soul (12-1) will take on the Tampa Bay Storm (10-3) at the Wells Fargo Center Saturday at 7 p.m. for the final game of the regular season. The Soul lead the season series with the Storm, 2-0.